Today, when you order "Spin Doctor (Cards and DVD) by John Bannon", you'll instantly be emailed a Penguin Magic gift certificate. You can spend it on anything you like at Penguin, just like cash. Just complete your order as normal, and within seconds you'll get an email with your gift certificate. Anything put out by Bannon is good. 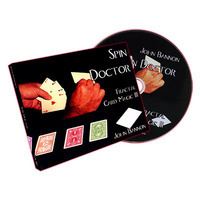 In Spin Doctor, 4 aces are shown and one by one they are the only card face up in the face down packet. 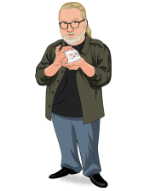 At the end, the Ace of spades is held in one hand and it is flicked and turns blank and visually returns between the 3 face up aces held in the opposite hand. The aces are turned over and they are now shown to all have different colored backs! Everything can be examined. There are no gaffed cards in this trick unless you want to consider a blank face a gaffed card. People's reactions are ALWAYS one of OMG!!!!! The only reason I did not rate it 5 stars is that Bannon's "Royal Scam" is even more flashy, but it is a longer trick. Ok, So I actualy bought this from the only magic shop in my county that's left. I was actually getting it because of a few reasons, but wound up with a list of Ten... Enjoy! 2. It comes in a nice DVD Case, with all needed cards... and the cards are really nice.. not just something you can conjure up from decks you may or may not have laying around. Plus the dvd was nicely put together and is pretty crisp on picture quality and sound... and the camera person knows what they're doing. 3. I got it for a really nice price! 5: It's literally the first effect that I've bought in a decade, that required me to actually pay attention to the dvd and watch it all the way through! Normally when I buy any kind of Magic item, If I've seen it performed at least twice (Even in the trailer), my mind can reverse mechanisize the effect.. and I'll figure it out - along with my own suitable patter. This one I had to watch twice.. which is pretty impressive. 8: They aren't just another "Spin" or "Flip" trick... John designed it to rekind one's love for working with both packet tricks, and the moves needed to make the routine come to life! 10: repeat #9 then go to #1, work your way back to #10.. and let the information be absorbed by your Sub-Concious Mind...! Well thanks for taking time to read my review, I'm sure that by now if you didn't find it helpful (And I'm sure you did), then you at least found it humorus and that's just what The Doctor (Me) ordered! Not a big fan of this. It's just not an effect that's going to get big reactions. Even an unsophisticated spectator understands the general concept of false counts and displays. If you execute this competently, you will get a reaction like, "You were very skillful in disguising which cards you were holding", rather than, "Wow, I have no idea how you did that!" For some people, this might not be a bad thing. All you need to know to perform this is an Elmsley Count, yet to a layperson, it might give the impression that more advanced handling skills were required. So, if your goal is to impress someone with how you can handle cards, this might suit you; if your goal is to fool a spectator and leave them baffled, I think you need to look elsewhere.